Are you looking for guaranteed curb appeal for your home? Add some charm to your house with raised panel shutters in Acworth, GA, from Duke Shutter Company. These shutters offer a uniquely traditional look while combining a contemporary style. Make a lasting first impression with raised panel shutters that are completely customizable. A home without shutters looks ordinary. Transform your house into a something special by accenting it with beautiful raised panel shutters. From rich wood shutters to durable vinyl shutters, we have many options available at our Acworth, GA, business. All of our products are made with excellent quality materials that stand the test of time. For exceptional value and stunning beauty, you simply cannot go wrong with raised panel wood shutters. From southern pine and cedar to cypress and redwood, you have many options to choose from. Best of all, we create your wood shutters exactly the way you want them. The team at Duke Shutter Company in Acworth, GA, knows how to add character to your home. When you want quality wood raised panel shutters, we have different options that ensure your shutters are specifically designed to suit the style of your home. Cheaply made shutters not only depreciate over time, but they also detract from your home's appeal. For superior raised panel exterior shutters, available in vinyl and wood, turn to our window shutters company in Acworth, GA. These types of shutters are time-honored additions to your home. They create a distinguished look that makes your home truly unique. 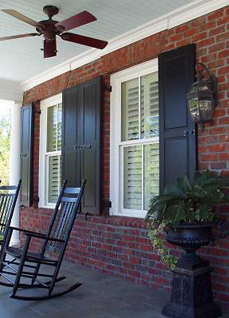 Built to last, vinyl shutters offer exceptional durability and lasting beauty for homeowners. They come in any color imaginable. If you're on a budget, you can have a classic look at a lower price than traditional wood shutters. Best of all, the raised panel vinyl shutters we offer in Acworth, GA, never crack, peel, or split. Contact us for custom raised panel shutters and complete window shutter installation services. We proudly serve customers in Acworth, Kennesaw, Canton, Woodstock, Marietta, Smyrna, Dunwoody, Johns Creek, Alpharetta, and Roswell, Georgia.